Cereal is one of my all time favourite meals, if i'm being really honest, I think i'd have it for all three meals a day if it wasn't frowned upon. But, although I do love a big bowl of Coco Pops or Special K, nothing beats homemade cereal. As with anything homemade, you can alter the recipe to your taste, and you know exactly what's going in, no horrible chemicals or extra sugar or salt added. 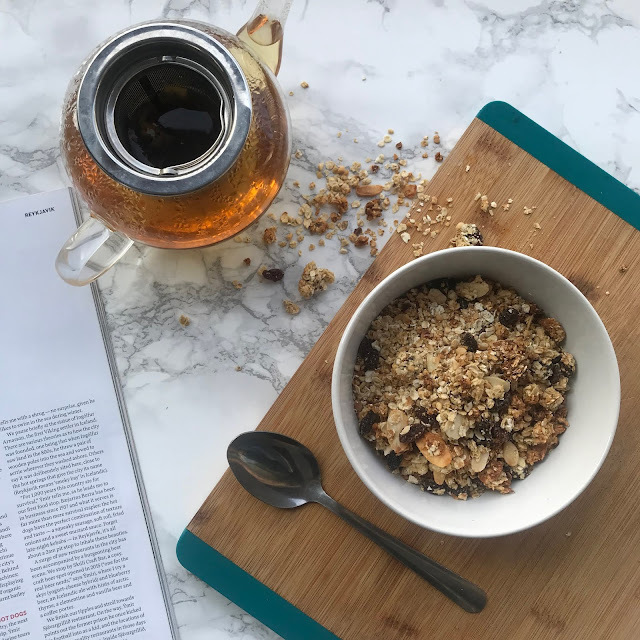 Here I bring you a super nutty granola recipe that you'll be enjoying each morning with your glass of OJ. As with anything, feel free to make any changes to the recipe to suit your taste, and add anything you think might add that special touch. -Pre-heat the oven to 150 degrees C.
-Mix together all of the dry ingredients in a bowl. -Add all of the wet ingredients and mix thoroughly. -Place the mix on a baking tray and cook for 30 minutes. -Check the mix throughout and stir. -Once cooked, leave to cool and keep in an airtight container. Each and everyone of us spend so much of our time trying to work out ways to make ourselves happier, whether that's with more money, abs or more time off work. But striving for this happiness means that we are leaving ourselves feeling unhappy and unfulfilled in our current situation. Striving for that perfection will only have a negative impact on your life as there will always be something better that you could have. It's like buying the latest phone, sure you're happy for a couple of months, but 8 months down the line when the new model comes out, you're suddenly feeling like you need the upgrade. Our need to consume in society in order to make us happy has gone way overboard. It sounds super simple, and you'll be thinking to yourself, 'it's just not that easy', but why isn't it? 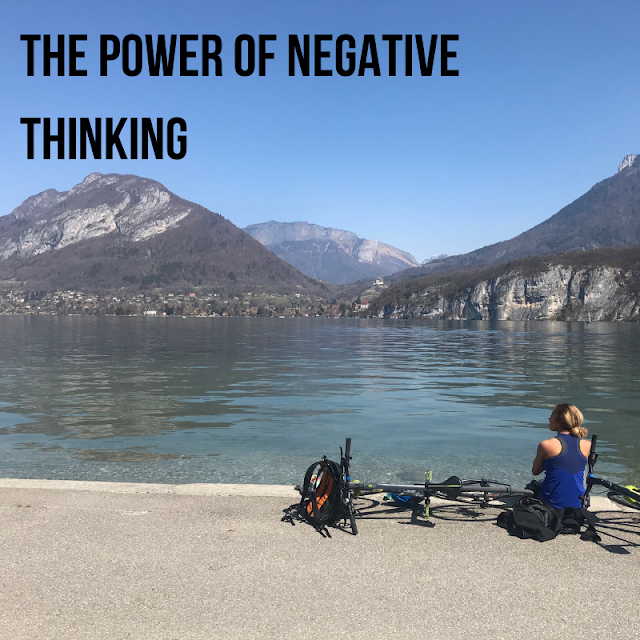 When it comes to negative thinking, you need to think about the things you don't like about your current situation in order to make the change. For example, if you don't like that you get out of breath every morning when you run for the bus then change this, join a fitness class, learn to run or do a sport. Likewise, if you don't like waking up to a job every morning that you don't enjoy, change it. Start researching what kind of jobs you like, get your CV polished off and start applying. By reflecting on the negative things in our life, it seems far easier to eliminate these than to come up with something you think might make you happy, but it might not. Sure you might think being slimmer will make you happy, but if you've not got a negative drive behind this (like getting out of breath easily) then what's the point? Now i'm not tell you to go and quit your job or run a marathon, it's all about baby steps. If you don't want to rush around getting the kids ready for school every morning and feel like you have a mini heart attack each day at 8am then do something small to change this. Get up earlier. I know those extra minutes in bed may seem precious, but if you could spend 15 minutes before the kids wake up having a cup of tea to yourself and having things ready for when they come downstairs then wouldn't you have a less stressful start to your day? This will also have a knock on effect on how the rest of your day goes. These small changes make a large contribution to how you spend the rest of your day. Plus, if you've got a big goal, then breaking it down into smaller goals makes it seem a lot more manageable. So, first things first, write down a list of the things that are making you unhappy in life. For one, this will probably clear your head a little and make you realise what it actually is that's not making you feel great. Writing things down is one of the best ways the release what's on your mind. Once you've got this list, write down next to each negative point what you can do to make this a positive, like the statements listed earlier. These don't need to be huge changes, just small steps to eliminate that negative in your life. You should also note that you don't need to erase all of the negatives at once as this would become quite overwhelming. Order the points from which is having the most negative impact on your life to the least and work on the ones that are having the most impact first. You'll feel a weight lift off your shoulders when you cross off that first negative. 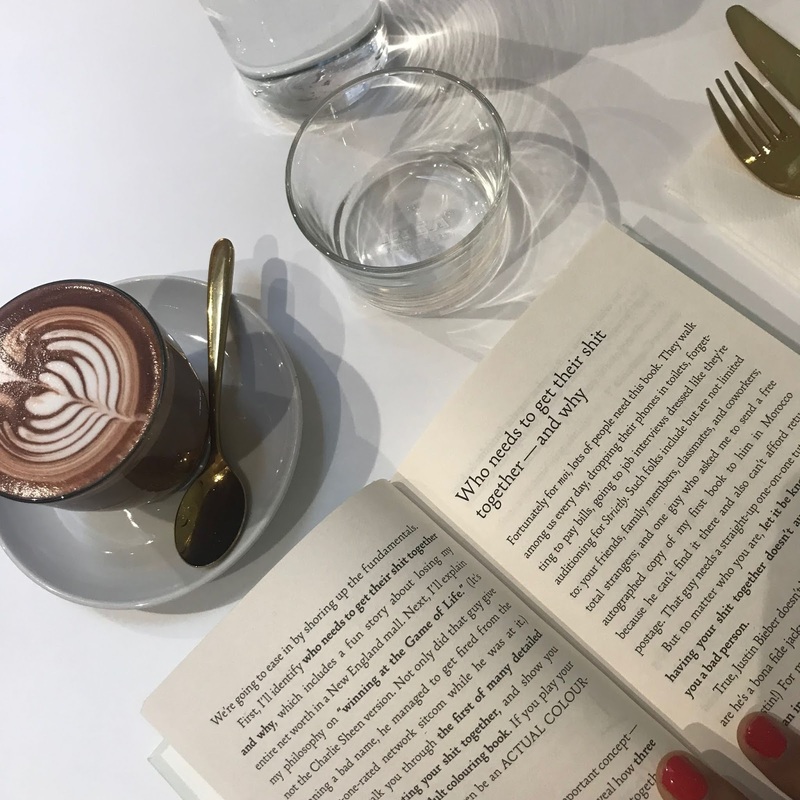 The reason I love reading fiction so much is because it allows me to escape reality and delve into a world so completely far from my own that I forget any stresses and problems that are usually passing through my mind. So, when visiting Peckforton Castle last weekend, it felt like I was living in a Medieval fiction novel, quite literally a dream come true. 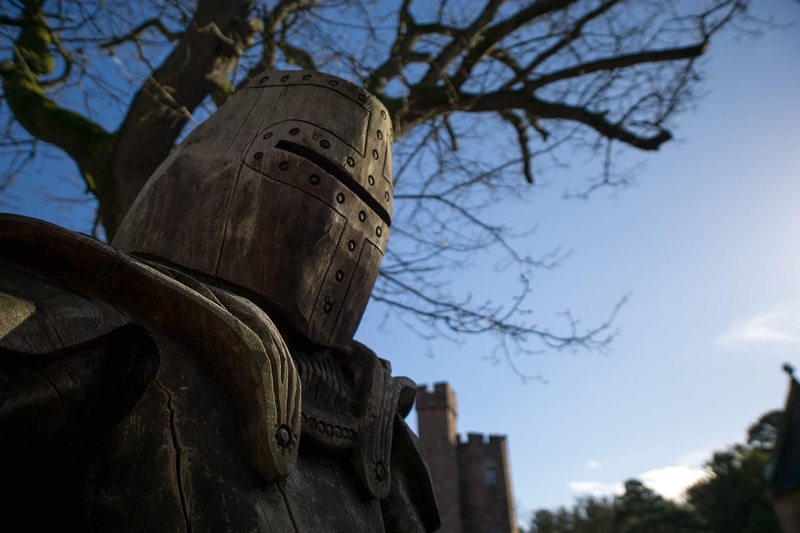 Placed in the heart of the Cheshire countryside, Peckforton Castle is a grade 1 listed building built between 1844-1850, a Victorian country house built in the style of a medieval castle at a time during a great gothic revival in architecture. It was built for John Tollermache, the 1st baron of Tollermache and in WW1 was used as a hospital for handicapped children. The outstanding building has held host to a wealth of history and in 2006, was bought by the Naylor family who transformed the castle into the hotel, wedding venue and spa that we know today. We only got to stay for one night but that's all I needed to relax and unwind. If you're based in the North West then this truly is the perfect city escape. Just an hour away from Manchester, this magnificent hotel oozes elegance and allows you to forget any problems you were panicking about 30 minutes previous. 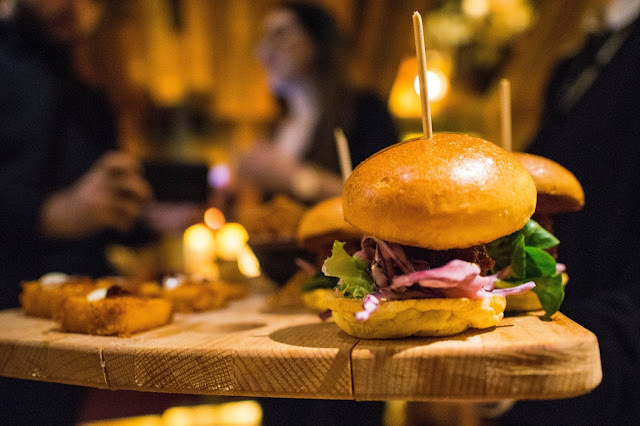 Booking a hotel for an evening may seem like an expense not worth paying, but surely spending that money with a loved one truly enjoying time together and forgetting about work is much worthier than spending that money on a night out. Then feeling awful and totally NOT refreshed the next day. If you have a few days to spend there you don't even need to leave the grounds to enjoy yourself. 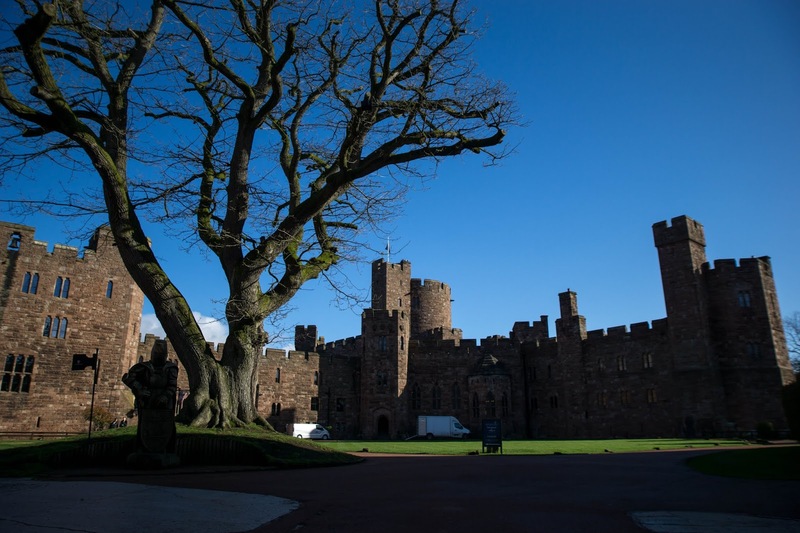 The castle holds host to a variety of different adventure activities such as archery, laser pigeon clay shooting and Segway tours. Or if you are solely there to chill then why not take full advantage of the spa facilities. When you book in for any of the treatments then you have access to the relaxation rooms, hot tubs, sauna and rainforest showers, now if that doesn't sound like the perfect way to relax then I don't know what does. Sometimes physically taking yourself away from your troubles can really help to clear the mind and let you breathe. 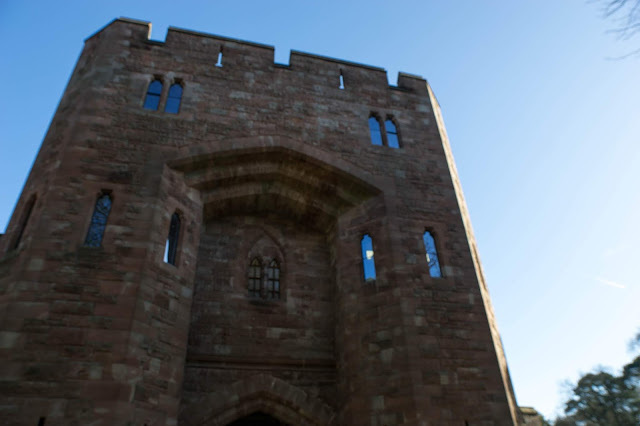 Whether you want to go away with someone or just take yourself away alone and get some headspace, Peckforton Castle is the ideal place for this. The staff are exceptional and you constantly feel at ease, something we all need from time to time. For more information, click here. #SelfCareSunday is a hashtag that has been used over 400,000 times on Instagram, it's a new hype to give yourself the ultimate pamper on a Sunday before the busy week ahead, and I think this is brilliant. People are finally coming to terms (including me) that today's society is killing us because of the constant stress we put on ourselves, and a day to just look after our mind and body is truly what we need to refresh both mentally and physically. Self care comes in different forms, from having a day to do all the things you enjoy doing, to have a full blow out pamper session with face masks and all. So, if you love a good pamper on a Sunday I have the perfect homemade face mask recipe for you. I'm very conscious about what goes on my skin, which is why I prefer to buy from natural brands, but there is truly no better way to know what goes in your skincare than if you make it yourself. The best thing is, most of the things you can use as part of your beauty routine often already live in your fridge! 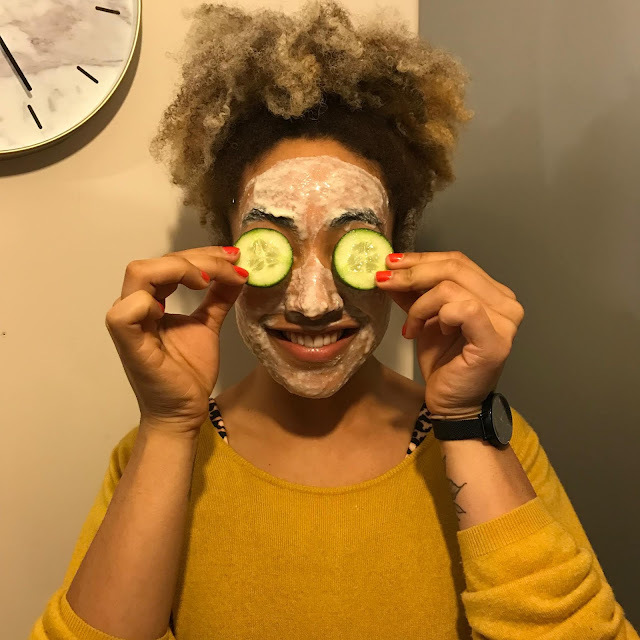 My favourite face mask for rejuvenating the skin is a quark and cucumber mask with added vitamin E. Quark is one of the latest 'superfoods', similar to cottage cheese and yoghurt, but with a naturally higher protein and lower fat content. It's full of vitamins and minerals such as B2, B6 and B12, as well as calcium which could have potential health benefits for our skin. Topped off with cucumber, it makes for an especially refreshing face mask. And I add the vitamin E for extra hydration for my dry skin. Simply peel a quarter of a cucumber, cut into chunks and then place in a blender until smooth. Then add this to 6-8 tablespoons of quark and 2 drops of vitamin E oil and mix until well blended. Make sure your face is clean and dry, then evenly spread the mixture onto your face and leave to sit for 30 minutes. It may feel tight or itchy on your face, but don't worry, that's just the enzymes in the quark doing their magic. To remove, simply wash off with warm water. Do not apply any face creams immediately after removing as the mask is still working its way into your skin. If you're looking for more ways of adding natural ingredients such as quark to your beauty routine you can find them all in the Ultimate Quark Guide and Cookbook here on the Queen of Quark website. You'll also get access here to a free eBook when you subscribe to their weekly emails. It's one of the easiest ways to gain more knowledge and you can do it wherever and whenever. How many of you spend time on public transport just sat scrolling through your phone, or staring out of the window not really doing much. This is definitely time you could be spending doing something productive, and that's where podcasts come in. Apple have the podcast app, or you can get podcasts on Spotify, search your favourite subject and then try different ones out until you find the right podcasts for you. You'll find anything and everything on there. I don't know about you, but I really struggle to work when in a messy environment. If your surroundings are cluttered then so is your mind, so having a clean, tidy working area can really help you to focus on what you're doing. Take 5 minutes before you start working to organise the area so you can set on the ahead with a clear mind space. If you struggle remembering things then this point is crucial for you. Make sure you always have a notepad with you so that you can take anything down that you need to remember. Often we don't do things because we forget all about them, being able to see what we need to do and physically tick them off a list can really help you on your way to a more organised life. If you know you're a master of multi-tasking then you can probably skip this stage, but for those of us that aren't quite so skilled then listen up. Trying to do two things at once often means that you aren't giving each task all of your attention which can mean the quality of your work is sacrificed. This isn't just doing two work tasks at once, but it also includes trying to do something whilst watching the TV or scrolling on your phone. Hone your attention on one thing. No one can solidly work for hours on end without burning out, unless you really are a superhero. Scheduling in rest breaks in between work can help to keep you focused when necessary. This isn't just 5 minute tea breaks, but it is essential to move around and do things that take your mind off the initial task. That way you come back to your desk with a fresh mind, ready to give it your all. With the fitness industry currently booming, there have never been more ways to work out. Whether you’re an old school bodybuilder or an endurance athlete, battle ropes are the perfect piece of kit to supplement your training. No matter if you’re training arms, back, chest or legs, the ropes can give you a full body workout. The best thing about them is that they work individually, meaning you’ll be putting effort in from both sides of your body, eliminating any chance of muscle imbalance. Hate cardio but need to get that extra aerobic training in? Battle ropes solve this problem in an instant. 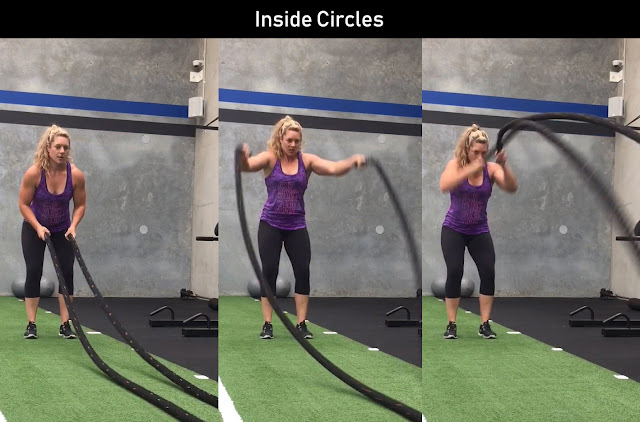 Instead of standing on the treadmill for 30 minutes blast out a 10-20-minute circuit with the battle ropes and it’s guaranteed that your blood will be pumping, your heart rate will rise and you’ll work up a sweat. And by doing HIIT workouts you’ll be using your aerobic and anaerobic systems, giving you the optimum training session. Battle ropes come in all weights and sizes to suit your needs and surroundings. If you’re new to training then there are lighter options available, or if you’re looking for a hard-core workout then you can get ropes up to 53 pounds. Ropes also come in varying lengths, therefore if you are looking to add this piece of kit to your home gym, you can get shorter ropes that don’t take up too much space. Standing in a high squat position with wide legs to keep you grounded, lift the battle ropes one arm at a time up to head height and back down. As you continue to perform the exercise you will notice the ropes forming a wave pattern. For optimum results, you want to be creating large waves with them. Make sure throughout the movement you are keeping your core muscles engaged to keep your body stable. This movement works both the arms and shoulders singularly, therefore allowing you to separately use the muscle whilst avoiding strength imbalance. 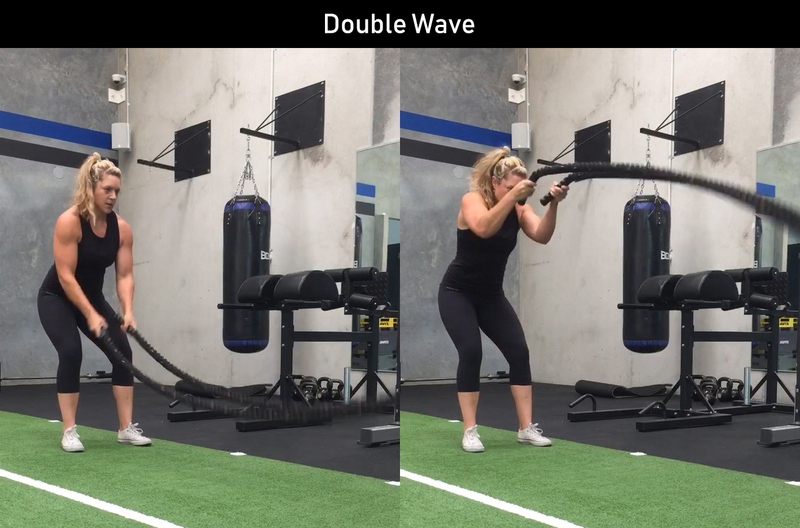 This exercise follows the same pattern and the battle rope waves except you are lifting both arms at the same time. 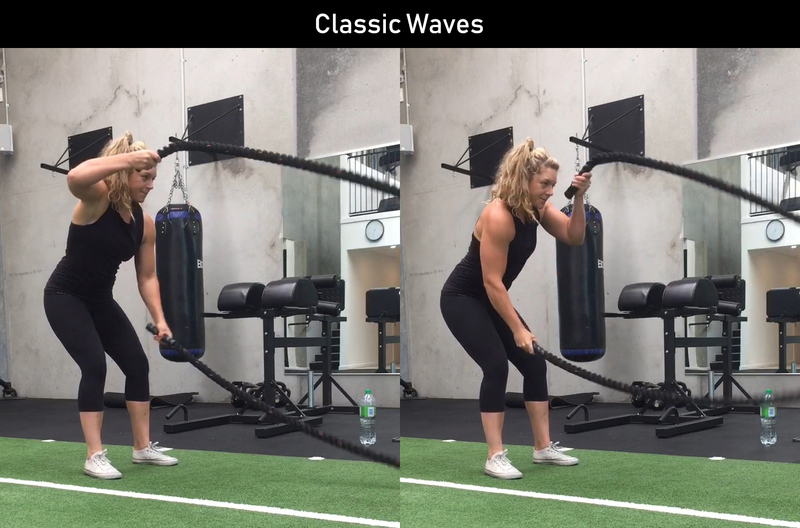 The movement mainly works your shoulders and the aim is to get the ropes making large rippling waves. Begin this exercise with your hands close together around waist height and slowly start making large circular movements inwards with the ropes. As you become more confident you can pick up the pace creating large circles lifting most of the rope off the floor. Keep your knees bent, at least hip width apart and engage your core. By placing yourself in this position you are still utilizing other muscles in the body whilst focusing on the shoulders, giving you a full body workouts. It's late, cold and dark, so the only thing that will convince me to leave the house on my night off is food, and plenty of it. I'd recently seen that Impossible were hosting a launch for their new menu and I knew I couldn't miss out. 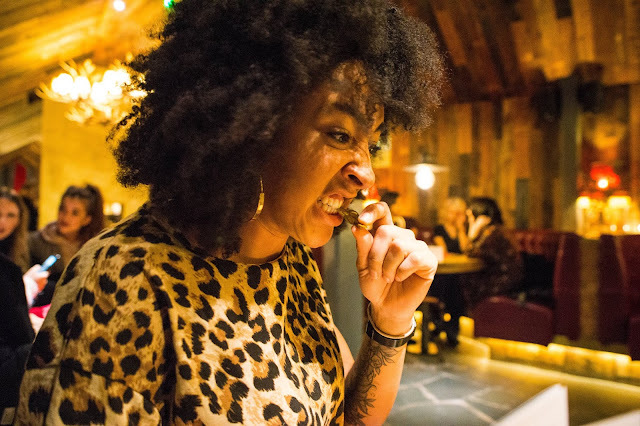 The bar is known for it's cool vibes, quirky decor and extensive gin menu, so adding a sh*t hot food menu is only adding fuel to the ever growing fire. If you've been around Manchester in the last few months and headed down Deansgate, you'll most certainly have come across the bright lights and long queues outside Impossible. 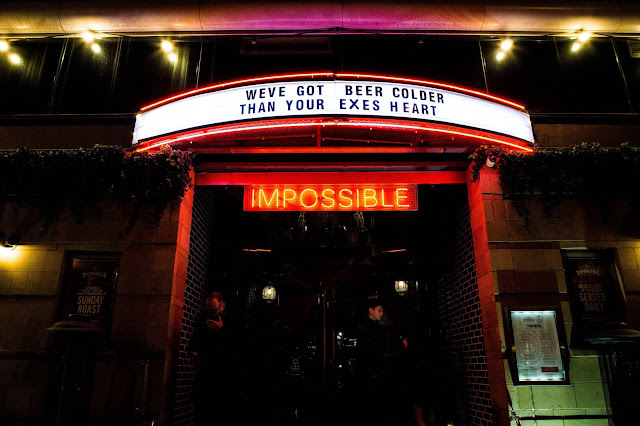 Their quirky old-school cinema sign with some sort of witty quote (this week's is 'we've got beer colder than your ex's heart) is a sign of what lies inside. We headed upstairs where we were greeted with parma violet cocktails in what felt like an old victorian opium den. 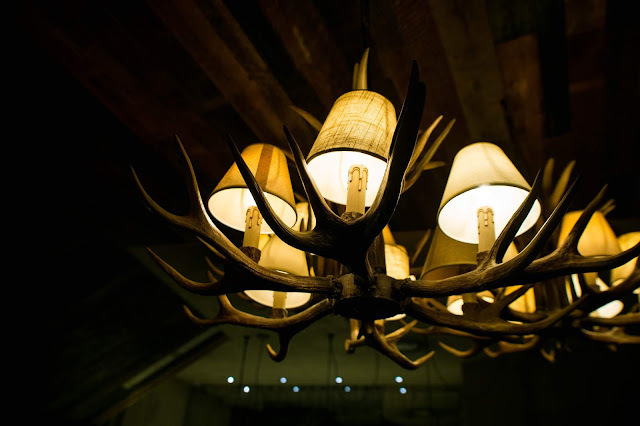 Deep red booths and long bench-sofas were the perfect accompaniment to the relaxing ambience, add the stag antlers and 1930s speakeasy bar, you've got a fusion of all things great. 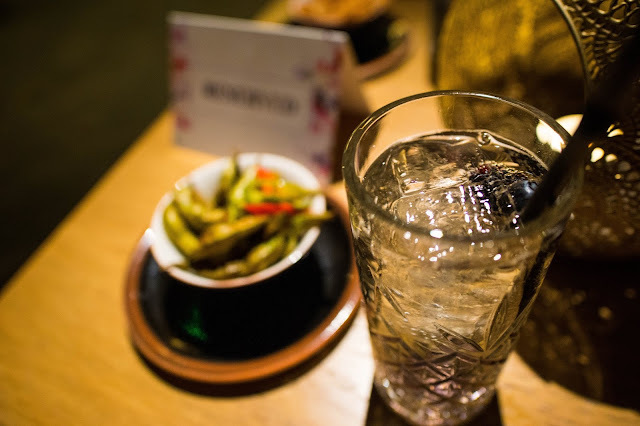 The tables were set out with spicy lotus root crisps and spiced edamame just to get the tastebuds ready for the real deal. From here came the main show...waiters served platters of bite-sized versions of the menu so we were able to try a selection of foods. My favourite was the chicken and waffles, rosemary infused waffles served with tobasco syrup, coleslaw and fried chicken. The reason this did it for me was the rosemary, I'm not usually a fan of chicken and waffles because of the sweet savoury combination. however, the rosemary making the waffles savoury meant I could really appreciate the dish. Other items on the menu consist of Kentucky fried cauliflower, halloumi bites and the Impossible royale burger; chicken wrapped in a crispy coating with salad and house slaw served on a soft brioche bun, I know....it sounds good doesn't it? 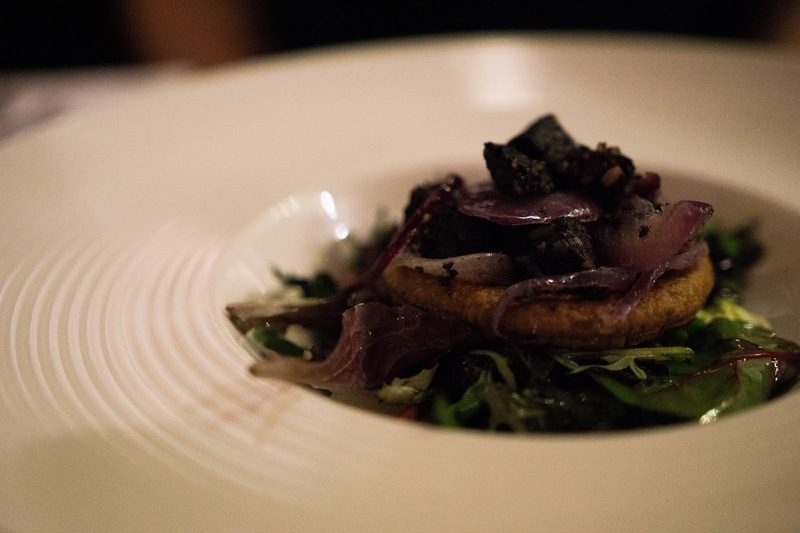 There's plenty more fusion dishes to offer on the menu which you'll have to try out yourself, take a look online here and book a table now. If you're travelling from Manchester then it's an easy 1h30 drive away, if you're not a confident driver then i'd steer away from going on a rainy day. The fog clogged up the roads ahead leaving us squinting to see if there were cars just 5 meters away from us. You feel like you've just stepped onto the set of The Others, look left or right and there's only white mist to be seen, a pretty eerie vibe but once you're clear of that then it's all grand. Once you reach the little village of Wetton, you want to follow signs to the car park where you'll begin your journey. No fear if you've driven all this way and you're holding in a little, there are relativley clean toilets by the car park so you're not having to squat in the woods. Boots on, jackets zipped and backpacks filled with food, it's time to start your walk. Head right on the road of the car park and you'll come to a right turn by the side of a farm with a sign pointing to Thor's cave, that's the route you want to take. Walking here you'll have farms either side of you and then reach a T junction where you'll go left, walking away from the village and then eventually slide left again onto a mud path between two fields. The pathways are relativley well market with wooden signs of where to go, as you walk through the path, chances are you'll see plenty of people walking the same way anyway so no fear. Keep walking down and you'll begin to see what looks like a big cliff edge on your right ahead, that's where you want to be. 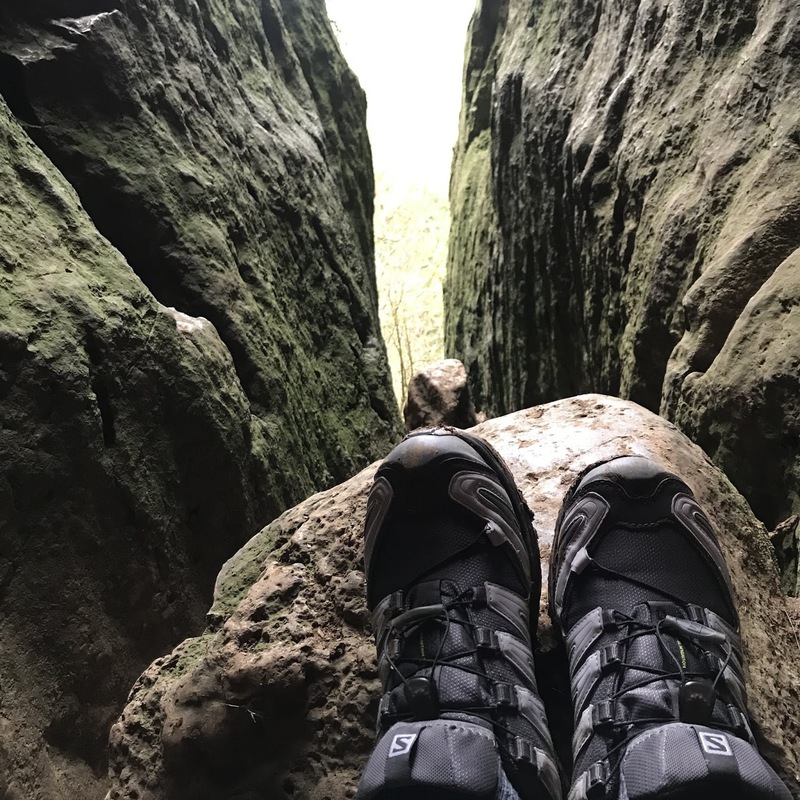 It's not a very long walk, approx 25 minutes and after clearing the path you'll reach a slightly rockier part on the way up to the cave, be cautious in wet weather or with younger people. It's pretty clear from here where you're going, you'll see the opening of the cave and it's more than enough to blow you away. The best thing is, you don't know where to look, the cave is wonderfully magnificent, but as is the view that it's overlooking. Before you step into the dungeon, i'd suggest taking a moment to sit on the edge and just take in the beauty that is the Peak District. You're located in the Manifold Valley, White Peak and no matter whether the weather is bleak and desolate or the sun is beaming, it's more than enough to take your breath away. Heading into the cave, be careful of the smooth surfaces where water has eroded the rock, it can be extremely slippy so you're best staying low and using your hands at points to grip and pull you up. It is known as a karst cave and consists of several different chambers inside. I'm not lying when I say it really feels like you'll shine your torch and Dracula will be dangling from a ceiling somewhere ready to pounce. It is a little eerie but if you're anything like me, it'll only fill your head with the imagining of what has happened here and stories that could be set in such a gothic surrounding. Once you've had a good rummage, you can head back the way you came or head straight down the steps in-front of the cave, you'll walk down a set of stony stairs in-between the trees where you'll eventually reach a split, go right in an upwards direction. From here you'll reach a farm gate, head up the steep incline and you’ll eventually reach the T junction you were at earlier and make your way back to the car park. I’m on the hunt for beautiful locations to hike this year, so if you’ve got any suggestions let me know on social or comment on this post! Plastic is bad for the environment, end of discussion. There's no two ways about it. Throwing that plastic bottle away or speeding through plastic straws on a night out are only going to end up in landfill that will not decompose properly like natural objects, or worse, end up killing our wildlife on land and in the ocean. As a whole, the world is producing around 300 million tonnes of plastic each year, and where do you think it goes? It doesn't just disappear into thin air. Soap seems to be old fashioned these days but it may be wise to swap your plastic bottled hand wash for a standard bar of soap. This means zero waste and usually lasts much longer. Organic health stores and markets often sell soap with paper or zero packaging to help reduce the waste, plus choosing organic, natural products means you know what's going on your skin. They're being sold everywhere at the moment so you've got no excuse not to pick up a flask or re-usable bottle to hold hot and cold drinks. Many coffee shops even offer discount on their drinks if you bring a re-usable cup, we're all trying to make the change. If you opt to buy a flask for your hot drinks, you'll be saving a pretty penny making your own hot drinks instead of spending £3 on a coffee every morning. Britain are soooo far behind other countries in terms of supermarket packaging. When i've visited Europe and America, standard supermarkets have most fresh products available loose with the option to use a PAPER bag. Sure we can buy loose fruit & veg, but we still have to wrap them in a plastic bag over here. Some organic supermarkets in the UK also offer loose cereals, beans, grains and pulses that you can dispense in your own jars, so simple but makes a big difference. Milk runs are making a comeback, more and more young people are making an active effort to change their habits to reduce waste and as a result, some careers that were seen to be dying are making a revival, such as this one. Get in contact with your local delivery and check the prices and opt for glass milk bottles instead of plastic. More and more services such as Creamline are extending their services to deliver more local produce, helping the environment and local businesses. We all flew off our handles when the 5p bag came into place, but it really does stop cheap, plastic bags being chucked onto the road and blowing down the street, making our towns look dirty and also harming animals. Every supermarket offers re-usable bags so take advantage, they are usually sturdier and although they may cost a penny more, they'll work out cheaper in the long run.